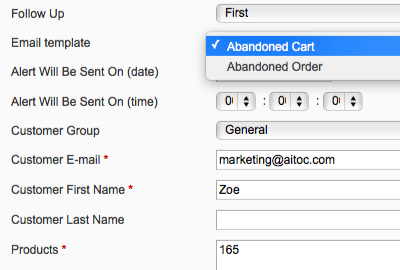 Send auto-reminders about abandoned carts or bounced orders in Magento. 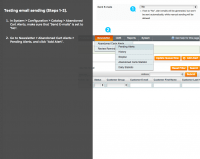 Send up to three (responsive!) followup emails. Use coupons and track recovered carts with ease. Bring back customers who didn’t finalize their purchase. Recover lost sales automatically and track the results. Easily set up email reminders and use coupons in them. 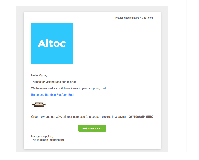 A well-thought-out email campaign is an essential element of an abandoned cart recovery strategy. Leveraging the module, online retailers get an ability to create highly personalized email messages with irresistible deals and offers for the customers who left. With such an incentive, prospects will be more likely to return to the website and complete the checkout and so convert into actually buyers. In order to reduce cart abandonment rate is important to understand why a customer has not finalized the purchase in the first place. This can be achieved with the help of the extension. Apart from encouraging buyers to come back to the store, retailers can kindly ask the reason for product abandonment. This way they will foster trustworthy and open relationships with their customers , also getting a valuable insight into possible ways of improving the current product assortment, shipping policies, and other critical aspects. There is no doubt that one cannot combat cart abandonment easily and for free, however, the efforts on achieving it can be optimized. The extension is a truly cost-effective way to set up and automate cart recovery email campaigns, allowing retailers to save their resources and focus on other mission-critical tasks. Send reminders about items left in cart. Alert users about Orders that didn’t go through. Get a report with recovery rates and totals. 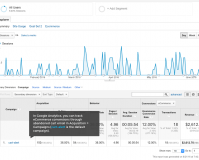 See eCommerce conversions in Google Analytics. Send reminders to registered users or guests. Send up to three followup messages (for both abandoned carts and orders). 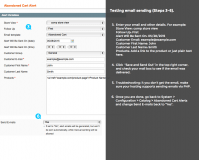 Choose from 5 different email templates. Dispatch alerts automatically or by hand. Track purchases made as the result of alerts. Use our responsive templates, edit them to your needs or create your own. Choose a time span after which to send followups. Include a promo code to increase sales. Get a plain-text version attached to the email. Send the first alert within minutes, if necessary. 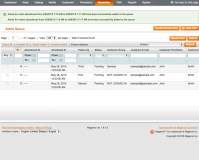 Automatically log in registered Magento users. Stop reminders after a purchase or a recovery link click, if you wish. 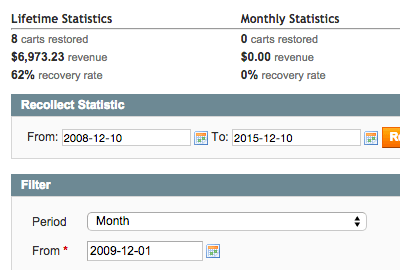 See revenue from recovered carts at a glance. 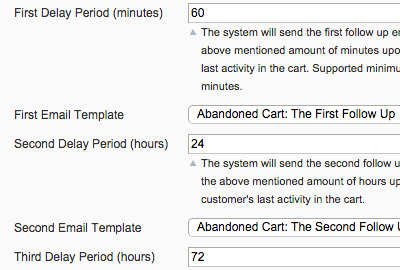 View recovered cart statistics for selected time periods. Statistics on abandoned carts, abandoned products, lost revenue. Statistics on restored carts, restored products, recovered revenue. See carts recovery rates for various periods. 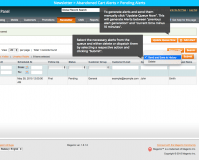 Abandoned Cart Alerts Pro for Magento 2 is now available! Compatible with One-Page Checkout Booster extension for Magento. Magento Multi Store Inventory plugin - Set up multiple warehouses, allocate products in stock accordingly and assign them to different store views or customers. 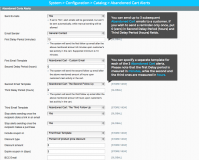 Magento Stock Management extension - Add as many warehouses as needed, manage their settings, define low and safety stock levels for each item, and receive automated notifications for the products running out. Magento User Roles module - Improve access management at your store by restricting access to specific site areas. 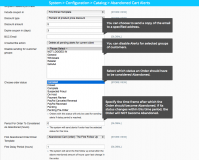 Create custom access rules and assign them to employees based on their responsibilities. Magento Page Speed Optimization extension - Reduce the load on your servers to improve web store performance and navigation. * Fixed the cron job notification message. * Fixed restore cart link with Google Analytics utm parameters. + Default subject fields for alerts have been modified. + Now e-mails for non-logged in customers are captured to a quote from any field (subscribe, login, register) on checkout for onchange event. This works even if the e-mail was filled in automatically by the browser. * Fixed the issues with abandoned cart statistics. + Added notification when cron in magento is not configured. * Fixed incorrect display of mail alert html version. + Plain text version of template is added to template to minimize the risk of getting templates to spam. + Added time selector for manually created alerts. 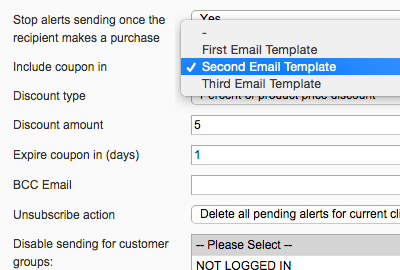 + Added an option to select Abandoned Cart email template when creating new alert manually. * Fixed the issue with 'NOT LOGGED IN' customer group missing in 'Disable sending for customer groups' section. * Fixed the issue with recover cart link in abandoned order reminder e-mail. * Fixed the issue with incorrect order_start_date when installing the extension. 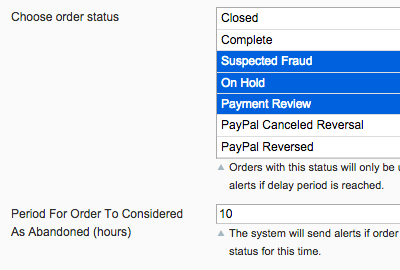 + Abandoned orders functionality is added - for the orders that were not successfully completed. 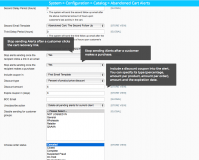 + Disable alerts for certain customer groups. + Added cart-tracking feature and detailed statistics. + The extension is now compatible with Magento 1.7.0.1. * Alerts are now generated for grouped products containing simple products with "not visible" status. + The extension is now available in English, German, Dutch, Italian, French, and Spanish. + Compatible with Magento 1.5.1.0. + Compatible with Magento 1.5. + Compatible with Magento 1.4. Choosing an extension vendor for a long time and stopped at Aitoc. This is the first extension that should install any store owner, because it allows with no effort to increase the main store parameter - revenue . There was a question with the settings and Aitoc support team responded quick. Thank you! Well, the features of ths extension + the tech support from this company = the best offer you can find on the market. I've been using this module for 6 months. The percentage of recovered carts increased from 10% to 24% after installing this module. The investments on this module were already returned. Greetings from Germany. A very user-friendly tool to recovery carts. Support is top-notch! An excellent solution that comes in really handy when you are working on recovering the abandoned carts. It is flexible as it also works with incomplete orders and even unregistered customers. Had a few hiccups at first, turned out I have misconfigured the settings. Aitoc quickly helped me with those. A must-have! We use the Abandoned Cart module, and needed as we were moving servers. From day 1, communication was prompt and intelligent. They did ask us to upgrade to the latest version, but that's no bad thing. In the end we had changed the template, which they reset, and all is now working. Fabulous support for such a low priced item. I highly commend Aitoc. Well done and you have with this bought loyalty to your company. So far, this is the best abandoned cart extension that I've used. It also has a built-in extension conflict checker and fixer. It will fix all conflicts for it to work. Once you install it, it will work immediately. Got no problems with this extension, just found out one minor bug regarding the link in the dashboard and it's quickly fixed by the Aitoc support theme. Installed it in Magento 1.9.0.1, that was later upgraded to 1.9.2.2 and I can confirm that it works in the old and new Magento versions. Installed this extension 4 months ago. It helped me to recover $50k+. Perfect results for $99 investment. One note - you should always track the effectiveness of your emails. I created the emails by myself after the installation as the default ones didn't convert nice in my store. Recommend this to anyone! We moved to Magento from Shopify back in 2013. Since then we have the abandonment rate about 55%. That was terrible number. We tried many solutions but this one decreased this number down to 35%. 20% in our business costs thousands of dollars per year. Thank you very much guys. You rock!!! This extension is brilliant for us to record the guest users and helped us to improve the User Expereince for better conversions. Must have extension. We have used this extension multiple times & it never disappoint us or our client .. Well done !! I have a few Magento stores and definitely recommend this extension. The initial set up is painless and you can easily track how well it is working. I have recovered multiples sales from this extension, must buy. My experience with this extension has been excellent. Very easy to install. Very easy to configure. After install we had some problems with the cronjob configuration in our server and the support people helped me to configure it. Thank you! It works perfectly! All the features that appear in overview works correctly. I recommend it! After setting this up its working nicely with no conflicts or bugs. No support required as of yet! Its a robust extension and feature rich yet easy to use. Great module... great support! Definitely recommend. Improve your conversion on a simple and clever way: just have your customers send an email automatically as soon as they leave your shop, with a filled basket but without actually buying products. The email send contains a link to the basket, so customers can easily get back to your shop and have their basket pre-filled. Easy to install and works like a charm. This extension works exactly as described and has increased sales bringing customers back to our store to complete their purchase. I definitely recommend it for anyone. This extension improved my sales at about 10% An excellent idea and developement. I did not even know, that my shop still contains the user data of abandoned carts. This extension recovers them and really: the people often wanted the sale but did not succeed in the first attempt. With the follow up mails they completed the buy and I earned much more in the first month as this extension had cost for me. A treasure. Great support and great extension. I give 5 out of 5 for support. The extension is very well thought out and works great. AITOC continues to provide best-of-class, meaningful solutions for Magento. Keep up the good work! This module is excellent. We have already bought and integrated it for 3 different clients and all are more than happy about it. Great extension and even better support. I was unaware of Cron Job setup on this and the guys walked me through it so it would automate the function. Awesome job guys! This is a crucial extension for anyone running an ecommerce store to have. People abandon carts for many reasons, not all relate to them losing interest. We use this extension to close more than 50% of abandoned shopping cart sales. It's also great for feedback to know why people aren't buying. This extension is a must. 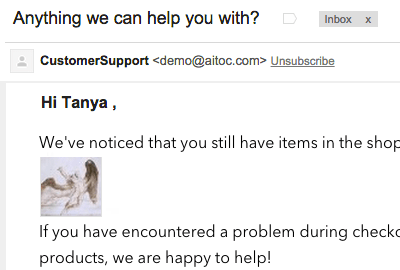 Plus, AITOC support is amazing! Purchased this module about a month ago. Install was very easy and encountered no problems what so ever following the user manual. If you are having problems installing this module, you shouldn't be working with Magento. It's as basic as it gets. 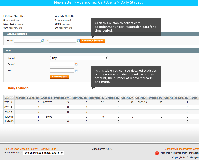 The only problem I had was finding the code that was generating the thumbnails in the email. Contacted support and they replied very quick pointing to exact file I needed to modify. Highly recommend them. 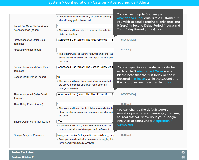 This extension is fantastic, it has paid for itself many times over in saved carts. My only qualm is that there are only 3 options for the coupon. I wish they'd allow you to set a coupon template to pull from instead of the limited options given from the cart. However, for $79 this plugin is very much worth the price. OK. Here it is. Bought the extension on Friday. Read the installation instructions carefully. Backed up my site on Sunday. Uploaded the files, following the instructions and installed the extesnsion on a very busy, live site on Sunday without a hitch (Not recommended, but I did not have any choice). My Magento site is new (Launched on November 1st, switched from Virtuemart after 5 years) so, I only had around $3500.00 worth of abandoned shopping carts on my Magento site. Sent my first emails to customers with abandoned carts around 3:00 PM and when checked again around midnite on the same day, I have recovered over $500.00 from those customers already. Highly recommended for the busy websites with a lot of new sign-ups or return customers. Technical Support: I have not try the support yet, because I didn't need to, and I hope it will be as good as the extension itself, when I contact them. Highly Recommended. I will definitely purchase other extensions from them. Keep up the good work.